To celebrate the summer solstice I decided to head over to Purse Moor to try and find a carved rock that was discovered in 2000. After much searching I failed to find the rock so walked over to In Moor to have a look at a site that was first described in the late 1940’s after aerial survey of the area. I first came across a reference to it in Hayes & Rutter’s research report on Wade’s Causeway. 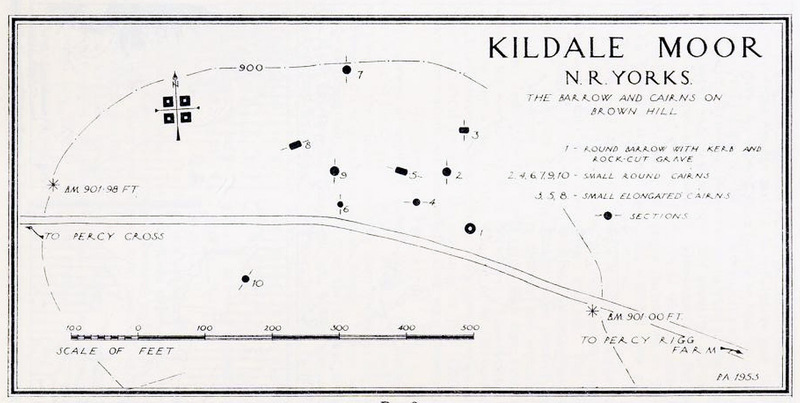 An oval-shaped enclosure bounded by ruined stone walls and measuring 488 feet NE-SW and 230 feet NW-SE. Containing 25 small cairns usually 12-15 feet in diameter. Iron slag and flint flakes found on surface. Date and purpose unknown. In late 2009 a large fire broke out on the moor revealing the site. I visited shortly after and took these photos. On returning, the moor has regenerated and the site has once again has disappeared into the heather. 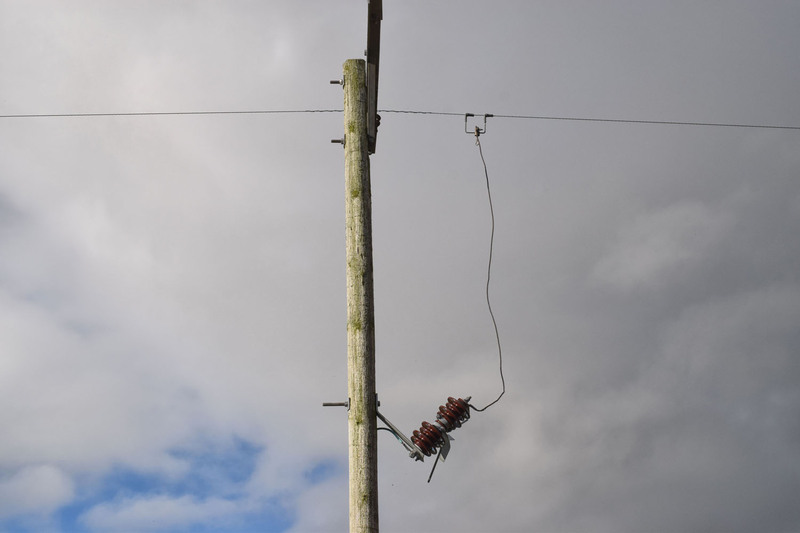 It can still be seen on aerial photographs. 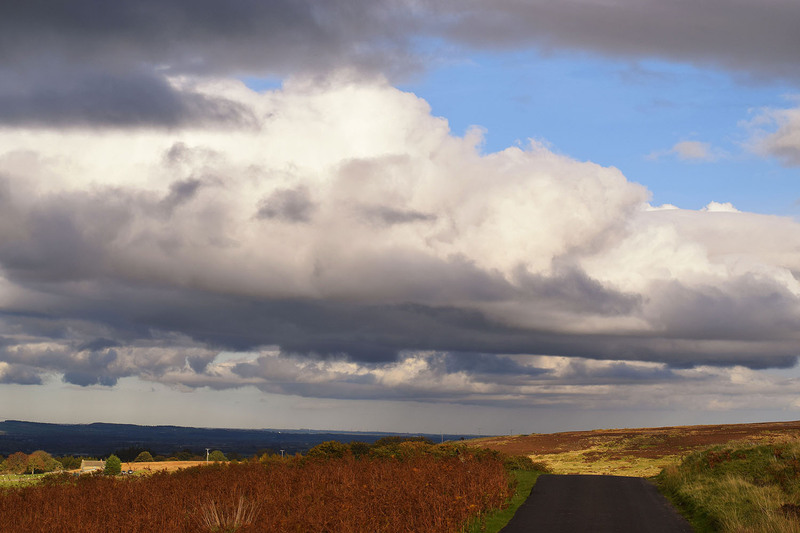 The road on Percy Rigg runs from Rosedale Head to Guisborough. The section that runs over Percy Rigg is called Ernaldsti, after Ernald de Percy, Lord of Kildale. On a grim drizzly day I decided to walk the road from its junction with the Kildale – Commondale road to Percy Cross. 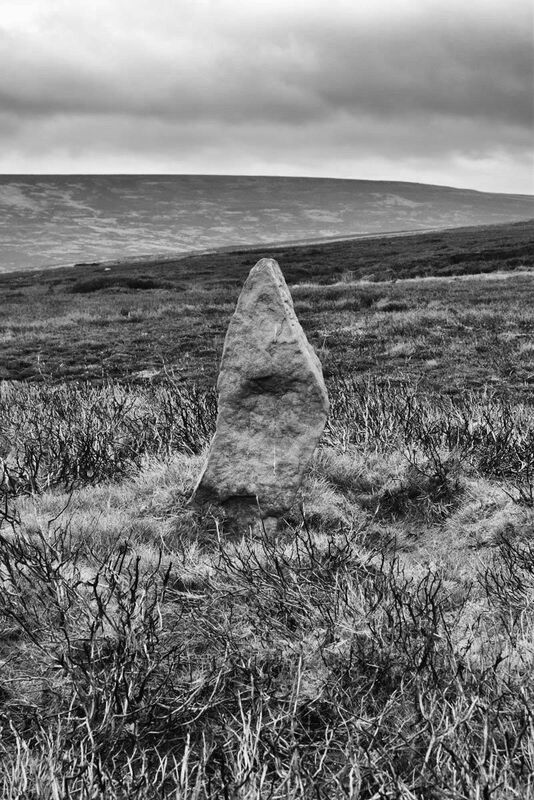 The surrounding moors are also dotted with standing stones, some are prehistoric, others are estate boundary stones. There are the remains of a large prehistoric settlement on the south west slope of Brown Hill. In 1953 Archaeologist Paul Ashbee excavated a number of small cairns and a large round barrow on Brown Hill. He discovered a rock-cut burial pit beneath the barrow and very little in the cairns, concluding that they were probably clearance cairns. A number of the earthfast stones beside the road are marked with benchmarks. 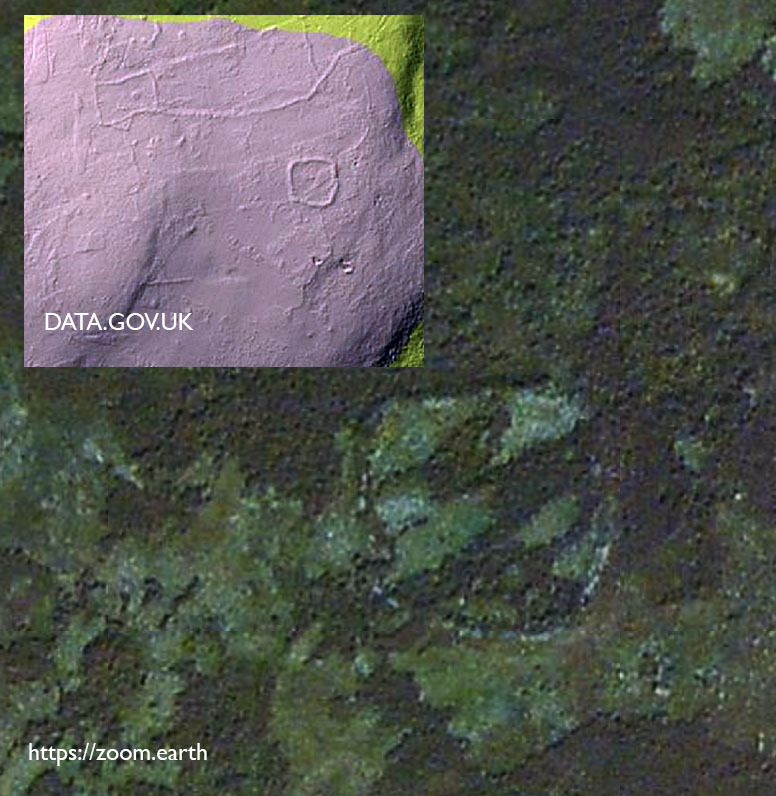 Local Archaeologist Roland Close excavated a group of hut circles beside the road. He found two large huts with paved floors, two smaller huts with central hearths and one hut with drainage ditches cutting through the two smaller huts. The main finds were nine saddle querns and some poorly-fired pottery sherds. 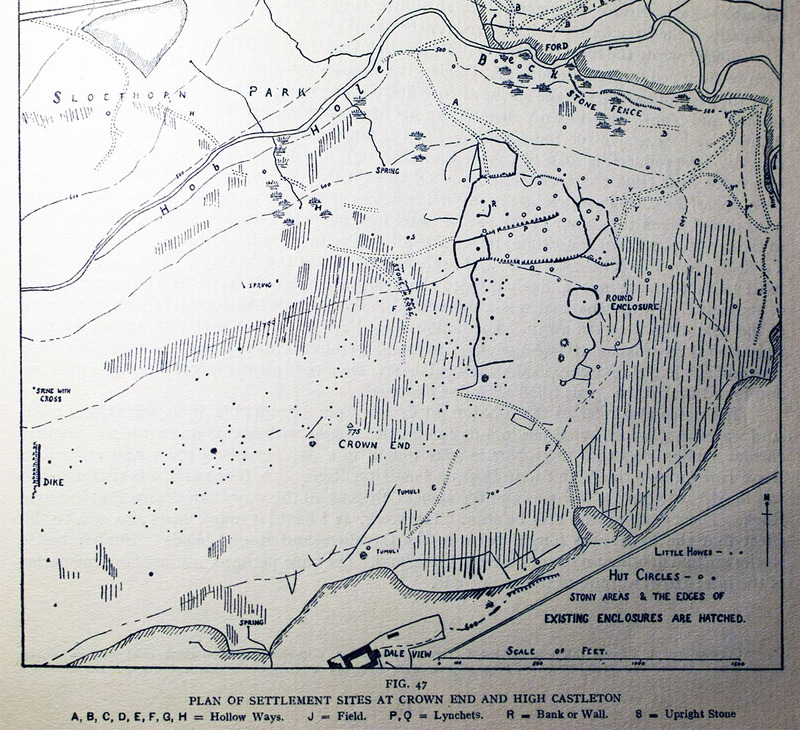 Close published his excavation in the Yorkshire Archaeological Journal. In his report he mentioned a permanent spring to the north of the huts, probably the primary source of water for the settlement. 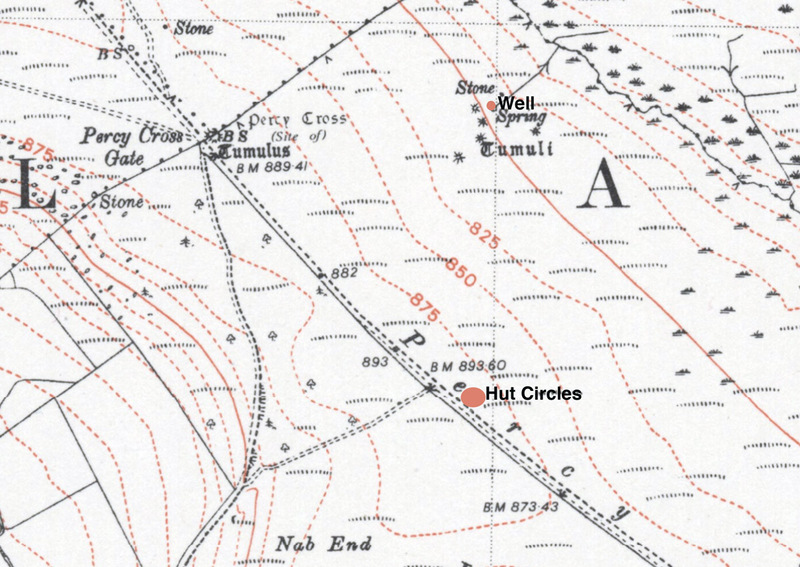 On looking through some old maps of the area I noticed that, on the 1950 OS map, a cluster of tumuli had been marked around the spring. If these tumuli were burial mounds it could mean that that spring held some significance, other than a source of water, to the people who lived there in the past. The spring emerges from the hillside into a man-made stone-lined trough and then flows down to the Codhill Beck. There is a standing stone close to the well, the sides of the stone have been dressed, this is probably an estate boundary stone. 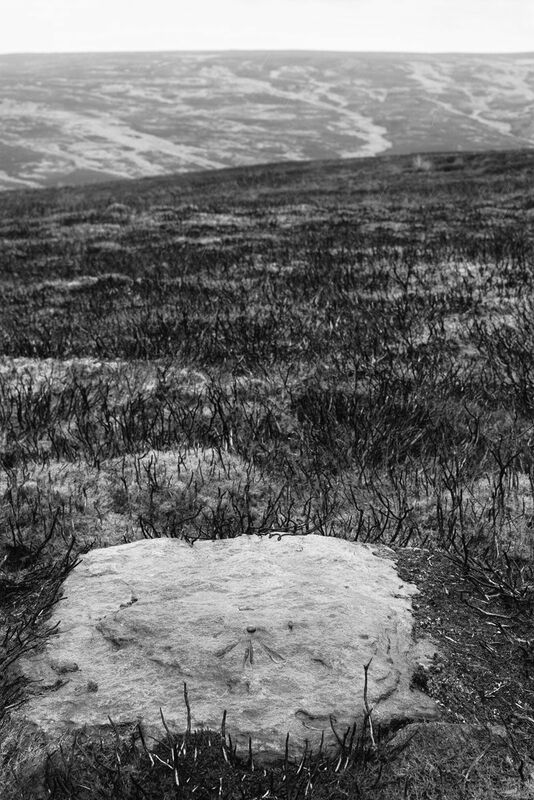 Unfortunately the moor above the site is covered in deep heather, I was unable to find the mounds marked on the OS map. This morning I headed over to Westerdale Moor. I’ve been visiting this moor for many years and have always had the place to myself. As I walked up to the moor from Hob Hole I noticed a group of estate workers over on Little Hograh Moor, I made a small bet with myself that I’d be getting a visit from a gamekeeper within half an hour of setting foot on the moor. 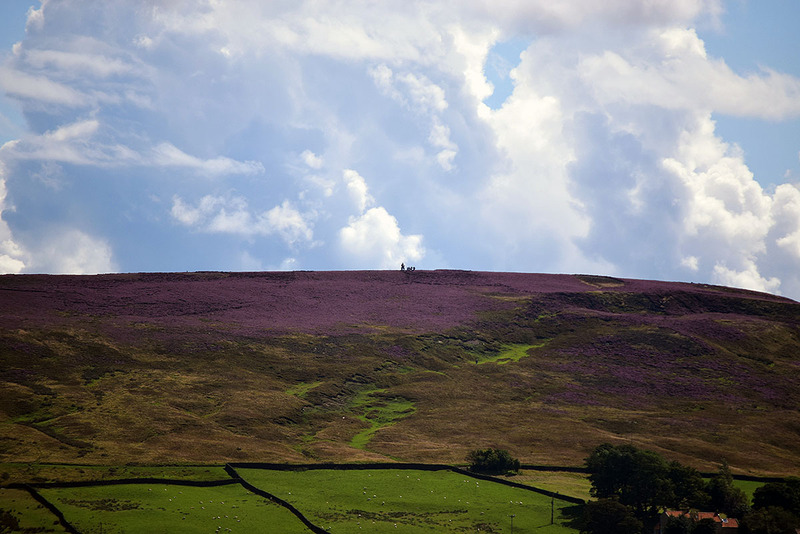 The heather is in full bloom and the moors look stunning, after a few short minutes my boots were covered in a fine dusting of heather pollen. Later I encountered thousands of tiny bees congregating on a sandy bank at the side of the path, I presume these were Miner bees making the most of the pollen harvest. Due north of the stone and about 100m over the ridge of the moor is an alignment of standing stones and boulders that runs for about 70m towards the Baysdale Beck, also known as the Hob Hole Beck. This alignment has been interpreted as a Bronze Age boundary and features in Blaise Vyner’s inventory of Cross Ridge Boundaries. Returning to the path I noticed an object embedded in the dry mud at the side of the track. 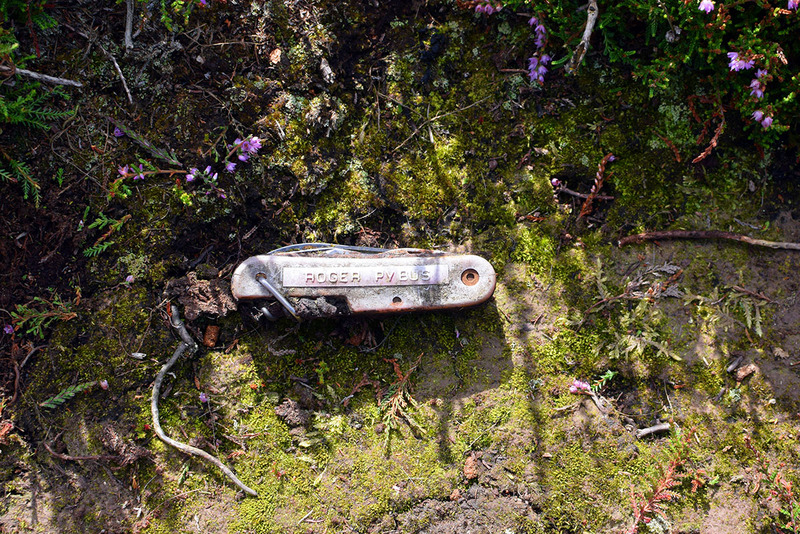 It was a Swiss Army knife, it had obviously been there for a while and had a name dymo-taped onto it, Roger Pybus. I pocketed the knife and a minute or two later noticed a large 4×4 pickup heading across the moor towards me, less than half and hour, I had won my bet. I walked up to the pickup and had a chat with the keeper. He was friendly enough and told me that he was checking to ensure that I wasn’t going to have a barbecue or fly a drone over the moor. He told me about the sculpture that his boss had erected on the far horizon. I told him that I was more interested in standing stones and asked him if Roger Pybus was one of the blokes he worked with, he said he was so I gave him the knife to return to it’s owner. On the skyline, Seated Man, a sculpture by Sean Henry commissioned by the estate owner David Ross and erected on Castleton Rigg. To the right of the sculpture are a group of visitors. The keeper, satisfied that I wasn’t a hungry drone pilot, went on his way and I continued eastward across the moor. This side of the moor is dotted with low cairns and banks. My next destination was the large embanked enclosure on eastern end of the moor. The enclosure is located on fairly level ground just before it dips down into the valley to where the River Esk meets the Baysdale Beck. The Enclosure is about 40m square with fairly well defined walls. The walls are made of stones with the occasional large upright stone on the inner face. The walls stand at about 1.5m high and 2-3m wide. There is a 3m entrance on the east side. The general consensus is that the structure is Iron Age in date, but this is not certain. I spent a little time walking around the enclosure and admiring the views along the Esk Valley to Castleton and then headed back to the road and Hob Hole via the Esk Valley Walk footpath. ..the belief in a race of little men who lived under the earth may stem from the first interaction of the Celts with the indigenous Bronze Age people. 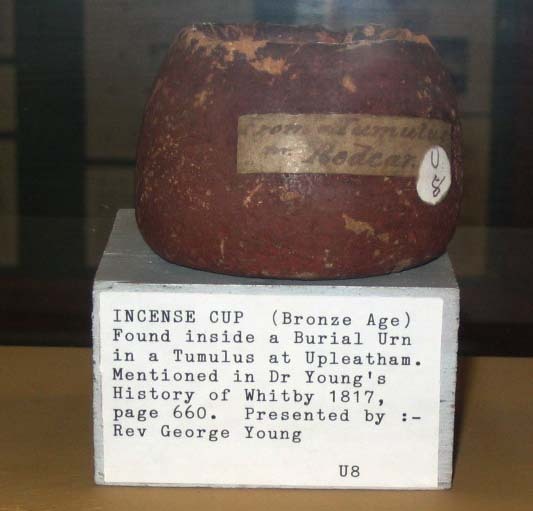 When from time to time, a howe was opened for some purpose, possibly to win stone, if the so-called incense cups were found, they were regarded as proof of the presence of little men. Frank Elgee’s map of Crown End. 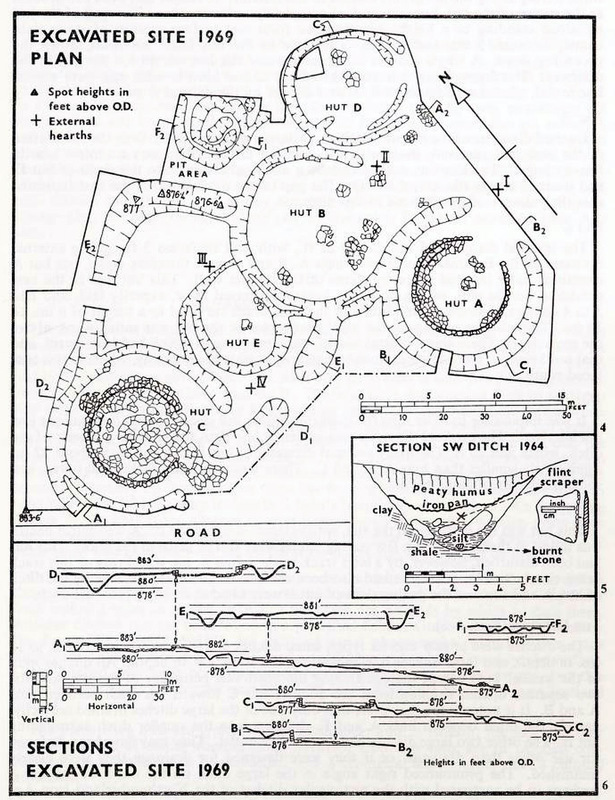 In his 1991 report, Bronze Age Activity on the Eston Hills, Cleveland, (YAJ no.63) Blaise Vyner lists 39 burial mounds and probable burial mounds and 13 cairns on the Eston Hills. 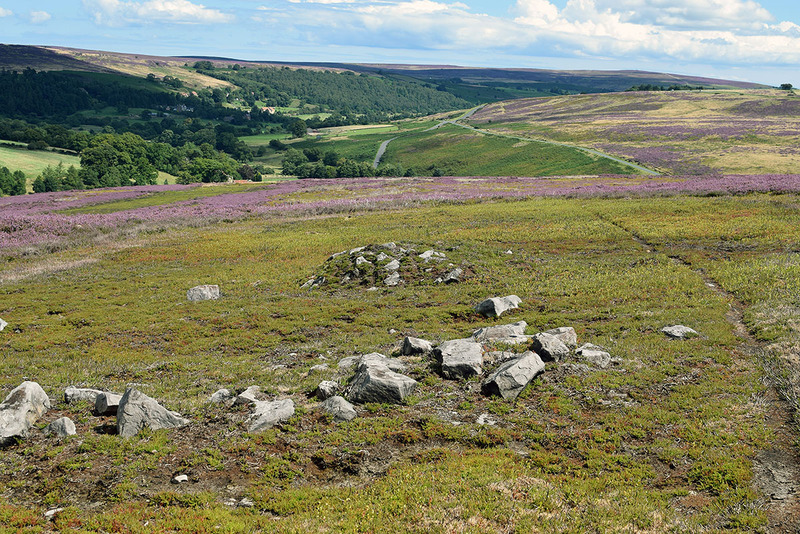 In their book, Prehistoric Rock Art in the North York Moors (Tempus 2005), Paul Brown and Graeme Chappell list over 29 examples of Prehistoric Rock Art from the Eston Hills.